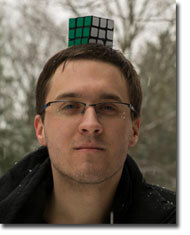 November 1, 2013 : Interview with Speedsolving.com member Marcin Kowalczyk : Currently (at the time of this interview) is the world record holder for 3x3x3 Multi-Blind (35/35 in 55 minutes). He has held (or broke) the world record 7 times in the last 18 months. Mnemonist (really, I make money on it). What is your favorite event, why? What made you become interested in solving puzzles? I got my first cube on 23th December, 2010. It was an accident, my ex-girlfriend bought one, nobody knows why. Then I tried to solve it and I discovered that it can be done faster and faster, as well as blindfolded. BLD was the only one reason why I didn't give up after 4 months; I was bored of solving cubes. What, in your opinion, is your biggest "cubing" accomplishment? I lost at Euro 2012 and I wasn't at Worlds so I don't have any interesting titles but I'm proud of having a much stronger MBLD memo than everybody else. 7 WRs is nothing if somebody can be able to beat me in the future. 35 points is still too low for me to call it an "accomplishment". I will be happy only when I can feel that I did my best and I can't be faster. And when nobody will be able to be faster It will be a real accomplishment. What do you see the limit being for 3x3 multi blind in a one hour limit? I have no idea but 50+ points is possible. I can't say anything else because we still know nothing about the limits. How come you don't compete in big cube BLD? I said to myself a long time ago that I won't compete in big BLDs until I know everything that I want to know about the 3x3x3 cube. Not only about BLD, but about all aspects of 3x3x3 cube. I don't see any fun in solving other cubes than 3x3x3, the true Rubik's Cube. How did it feel to break your first WR? My first WR was something special, being best in the world at something that you like is a splendid emotion. Second WR was also exciting. Rest of them? Nothing more interesting than getting any other official PBs. I was more happy after my official 9.58 in 3x3x3 than after 35/35 MBLD. Mnemonics. I also spent 4 years of my life on swimming, 6 years on playing Dungeons & Dragons (I was a GM). I'm longing for it but after school I lost all my players in different parts of country and I don't feel than I can start it again. What is/are your pet peeve(s)? Intentional loutishness, aggression with no reason, disrespect to others. These things made me very aggressive when I was younger. What will the future of cubing be like and how would you like cubing to progress? I hope that one day it will be a more official sport, with many more cubers and with sponsors. If somebody will pay real money for it then we will be able to see the real limits of all disciplines.